INT- Giant, Raven's Flock/Kevin Nash come out, Black Cat/Ohara/Gedo vs. Steiner Brothers/Ray Traylor, Ernest Miller vs. Yuji Nagata, INT- J.J. Dillon/DDP, INT- Scott Hall/Louie Spicolli/Larry Zbyszko, INT- Chris Jericho, Chris Jericho vs. Eddie Guerrero, Disco Inferno vs. Chavo Guerrero Jr., INT- Hollywood Hogan/Eric Bischoff, Rey Misterio Jr. vs. Juventud Guerrera (Cruiserweight Title Change), Randy Savage/Kevin Nash vs. DDP/Lex Luger, Giant/Sting/nWo come out. La Parka vs. Hugh Morrus, Bill Goldberg vs. Jim Powers, Billy Kidman vs. Juventud Guerrera, INT- DDP, Villano IV & V/Silver King vs. Super Calo/Chavo Guerrero Jr./Lizmark Jr., Dusty Rhodes joins for commentary, Steiner Brothers vs. Buff Bagwell/Konnan, Raven vs. Marty Jannetty, Disco Inferno vs. Saturn, Booker T comes out, INT- Nick Patrick, INT- Scott Hall/Louie Spicolli, Jim Neidhart vs. Louie Spicolli, British Bulldog/Steve McMichael come out, DDP vs. Chris Benoit, Raven's Flock interferes. INT- Hollywood Hogan/Eric Bischoff/Randy Savage, Billy Kidman vs. Prince Iaukea, INT- Raven/Mortis, Louie Spicolli joins or commentary, Meng vs. Hugh Morrus, Barbarian comes out, DDP vs. Mortis, Raven's Flock comes out, Steve McMichael vs. Jim Neidhart, Buff Bagwell vs. Chris Adams, Chris Jeriho vs. Chavo Guerrero Jr., Juventud Guerrera comes out, British Bulldog vs. Sick Boy, Eric Bischoff joins for commntary, Steve McMichael comes out, Raven vs. Chris Benoit, Raven's Flock/DDP come out, Bill Goldberg vs. Glacier, Ric Flair vs. Lex Luger, Sting/nWo come out. Eddie Guerrero/Chris Jericho vs. Booker T/Dean Malenko, INT- DDP/Raven, Fit Finlay vs. Brad Armstrong, British Bulldog vs. Dave Taylor, INT- Curt Hennig, Bill Goldberg vs. Rick Fuller, La Parka vs. Yuji Nagata, Disco Inferno interferes, INT- Scott Hall, INT- Buff Bagwell/Scott Steiner, Scott Steiner vs. Marty Jannetty, Curt Hennig vs. Jim Neidhart, Scott Steiner joins for commentary, Bryan Adams/British Bulldog come out, INT- Raven, Kevin Nash vs. Raven, Raven's Flock comes out, Kevin Nash gets arrested, DDP vs. Chris Benoit, Raven interferes. Randy Savage Harvard's Man of the Year Award video, INT- nWo, Bill Goldberg vs. Vincent, Eddie Guerrero vs. Prince Iaukea, INT- Nitro Girls, Juventud Guerrera vs. El Dandy, INT- Konnan/Juventud Guerrera, INT- Randy Savage/Hollywood Hogan, Lex Luger video, Scott Steiner vs. Chase Tatum, Curt Hennig vs. Jim Neidhart, INT- Raven, INT- Chris Jericho, Chris Jericho vs. Ciclope, Dean Malenko comes out, Scott Norton vs. Renegade, Giant comes out and gets arrested, DDP vs. Raven vs. Chris Benoit, Reese interferes, INT- Randy Savage/Elizabeth, Randy Savage vs. Bryan Adams, nWo attack Randy Savage, Sting makes the save. 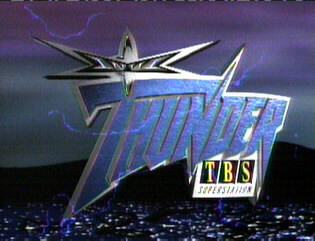 INT- Chris Jericho, Chris Jericho vs. Super Calo, El Dandy vs. Kendall Windham, INT- Curt Hennig/Rick Rude, Saturn vs. La Parka, Clips from Raven/DDP on MTV Live, Ray Traylor vs. Barry Darsow, Yuji Nagata vs. Prince Iaukea, Bryan Adams vs. Marty Jannetty, Eddie Guerrero vs. Psychosis, INt- Raven/Raven's Flock/Brad Armstrong, Bret Hart video, Chris Benoit vs. Scott Norton, Bill Goldberg vs. Wayne Bloom, Rick Steiner vs. Curt Hennig, nWo/Bill Goldberg/Ray Traylor come out. Saturn vs. Tokyo Magnum, Bill Goldberg/Raven's Flock come out, Yuji Nagata vs. Prince Iaukea, INT- Chris Jericho, INT- Raven, INT- Buff Bagwell, Chris Benoit vs. Konnan, Rick Rude joins for commentary, Curt Hennig vs. Jim Duggan, Lex Luger vs. Glacier, Buff Bagwell watches the match, Billy Kidman vs. Psychosis, Chris Jericho/La Parka come out, INT- Chris Jericho/Prince Iaukea, Scott Steiner vs. Disco Inferno, Booker T vs. Chris Jericho, INT- Scott Steiner/Eric Bischoff/Arn Anderson/Lex Luger/Rick Steiner, INT- Kevin Nash, Kevn Nash vs. Rick Steiner, nWo/Giant come out. Booker T vs. Chris Benoit, Stevie Ray interferes, INT- Giant/Bryan Adams, Reese vs. Van Hammer, Raven's Flock/Juventud Guerrera come out, INT- Eddie Guerrero, Eddie Guerrero vs. Alex Wright, Chavo Guerrero Jr. comes out, INT- Lex Luger, Fit Finlay vs. Psychosis, Glacier vs. Saturn, INT- Curt Hennig/Konnan, Dean Malenko vs. Silver King, INT- Chris Jericho, Raven vs. Disco Inferno, INT- Raven, Bill Goldberg vs. Hugh Morrus/Barbarian, Giant/Bryan Adams vs. Lex Luger/DDP (Tag Team Title Change), Sting comes out, J.J. Dillon calls in reversing the title change. INT- nWo: Hollywood, Dean Malenko vs. Scotty Riggs, INT- Chris Jericho, Billy Kidman vs. Juventud Guerrera, INT- Lex Luger, INT- Bret Hart/Eric Bischoff, Chris Benoit vs. Booker T, Bret Hart interferes, INT- J.J. Dillon/Dean Malenko/Chris Jericho/Jericho's dad, Konnan vs. Scott Putski, Saturn vs. Glacier, INT- Raven, Kanyon attacks Raven, INT- J.J. Dillon/Booker T/Stevie Ray, INT- Eric Bischoff/Elizabeth, Giant/Disciple vs. Lex Luger/Randy Savage, Bret Hart/Hollywood Hogan/Kevin Nash come out. INT- Lex Luger/Konnan, Steve McMichael vs. Mike Enos, INT- Raven/Saturn/Raven's Flock, Fit Finlay vs. Brad Armstrong, Giant vs. Disco Inferno, INT- Dean Malenko, Masa Hiro Chono/Tenzan vs. British Bulldog/Jim Neidhart, INT- Rick Rude, Konnan vs. Alex Wright, Eddie Guerrero vs. Chris Benoit, INT- Chavo & Eddie Guerrero, Sick Boy/Scotty Riggs vs. Public Enemy (Street Fight), Bill Goldberg vs. Reese. INT- Chris Jericho, Chris Jericho vs. Rey Misterio Jr. Parody, INT- Giant, Stevie Ray vs. Doc Dean, INT- Chavo Guerrero Jr./Stevie Ray, INT- Disco Inferno/Alex Wright, British Bulldog/Jim Neidhart vs. Public Enemy, INt- J.J. Dillon, INT- Raven, Billy Kidman vs. Saturn, INT- Steve McMichael/Mike Ditka, Bryan Adams vs. Bobby Blayze, INT- Raven, Booker T vs. Fit Finlay, INT- Booker T./Stevie Ray, INT- Chavo Guerrero Jr., Eddie Guerrero vs. Chavo Guerrero Jr., Kanyon vs. Konnan, nWo: Hollywood/Wolfpac/Raven's Flock come out, Giant vs. Lex Luger, nWo: Hollywood/Raven's Flock come out. INT- J.J. Dillon, INT- Curt Hennig/Vincent, Tokyo Magnum/Shiima Nobunaga vs. Public Enemy, Disco Inferno/Alex Wright interfere, Ernest Miller vs. Villano IV, Villano V interferes, INT- Eddie Guerrero, INT- DDP, Juventud Guerrera vs. Judo Suwa, Raven's Flock attacks Juventud Guerrera, INT- Steve McMichael, INT- Stevie Ray, Konnan vs. Stevie Ray, Booker T comes out, INT- Curt Hennig/Vincent, Raven/Horace vs. Saturn/Kanyon, Steve McMichael vs. Rick Fuller, INT- Chris Jericho, Chris Jericho vs. Ultimo Dragon, INT- Kevin Greene, DDP/Curt Hennig brawl. INT- Scott Hall, Scott Hall vs. Konnan, INT- Raven, Raven vs. Horace, Raven's Flock/Saturn/Kanyon come out, INT- Stevie Ray, Chris Jericho vs. Chavo Guerrero Jr., INT- Bret Hart, Disco Inferno/Alex Wright vs. Public Enemy, Meng/Barbarian come out, INT- Kevin Nash, Kevin Nash vs. Curt Hennig, Scott Hall/Lex Luger come out, Stevie Ray vs. Eddie Guerrero, Scott Hall/Giant watch the match, Bret Hart vs. Lex Luger (US Title Change). Wrath vs. Scott Putski, INT- Stevie Ray/Vincent, Mike Enos vs. Bull Pain, Ernest Miller vs. Disco Inferno, INT- Ernest Miller, Konnan vs. Silver King, INT- nWo: Hollywood/Konnan, INT- DDP, Kaz Hayashi vs. Evan Kourageous, INT- Lodi/Saturn, Kanyon joins Raven's Flock, Scott Norton vs. Jim Neidhart, Chris Jericho vs. Alex Wright, Curt Hennig vs. Van Hammer, DDP vs. Stevie Ray, Giant/Konnan come out. INT- Hollywood Hogan/Eric Bischoff/nWo: Hollywood, INT- Chris Jericho, Juventud Guerrera vs. Silver King, INT- J.J. Dillon, British Bulldog/Jim Neidhart attack Lex Luger backstage, Wrath chases Chris Jericho around backstage, INT- Jim Duggan, INT- Kanyon, Saturn brawls with Raven's Flock, Steve McMichael vs. Curt Hennig, Stevie Ray/Buff Bagwell/Arn Anderson/Dean Malenko come out, INT- Arn Anderson/dean Malenko/Eric Bischoff, INT- Lodi, British Bulldog/Jim Neidhart vs. Lex Luger/Bret Hart, INT- Konnan/Disco Inferno/Alex Wright, Konnan vs. Disco Inferno, INT- Scott & Steve Armstrong/Ernest Miller/Norman Smiley, INT- Rowdy Roddy Piper/DDP, Bill Goldberg vs. Rick Fuller, Hollywood Hogan/Disciple come out, Kevin Nash vs. Stevie Ray, Scott Hall interferes, Warrior writing appears on nWo: Hollywood locker room wall. Kanyon vs. Barry Horowitz, INT- Scott Steiner/Buff Bagwell, INT- Alex Wright, Raven vs. Alex Wright, INT- Chris Jericho, Booker T vs. Fit Finlay, Konnan's music video, INT- Ernest Miller, Ernest Miller attacks Kaz Hayashi, INT- Glacier, Horace vs. Norman Smiley, INT- Eddie Guerrero, Eddie Guerrero vs. Rey Misterio Jr., LWO come out, Chris Jericho vs. Prince Iaukea, Scott Hall vs. Disco Inferno, INT- Four Horsemen, Scott Steiner vs. Lex Luger, Rick Steiner comes out. Hollywood Hogan video, INT- Scott Steiner, Eddie Guerrero vs. Ciclope, INT- Eddie Guerrero/Ciclope joins LWO, Giant vs. Renegade, INT- Giant/DDP, Chavo Guerrero Jr. vs. Mike Enos, Rey Misterio Jr. vs. Villano V, INT- Rey Misterio Jr./LWO, Wrath vs. Chip Minton, INT- Kanyon/Raven, Kanyon/Raven vs. Chris Benoit/Steve McMichael, Konnan's music video, INT- Disco Inferno, Konnan vs. Disco Inferno, Scott Steiner vs. Scott Hall. Disco Inferno pinned Chavo Guerrero Jr.
Brian Adams & Horace Hogan defeated Billy Kidman & Chavo Guerrero Jr.
Perry Saturn & Raven defeated Mike Enos & Bobby Duncum Jr.
Dean Malenko & Shane Douglas defeated Barry Windham & Bobby Duncum Jr.
Diamond Dallas Page pinned Chavo Guerrero Jr.
Lash LaRoux pinned Chavo Guerrero Jr. The Barbarian pinned Chavo Guerrero Jr.
Buzzkill pinned Chavo Guerrero Jr.
Chris Candido pinned Chavo Guerrero Jr.
Lance Storm & Billy Kidman defeated Juventud Guerrera & Rey Misterio Jr.
Juventud Guerrera pinned Rey Misterio Jr.
"Hacksaw" Jim Duggan pinned Sgt. A.W.O.L. Scott Steiner pinned Rey Misterio Jr.
Chavo Guerrero Jr. & The Wall defeated Hugh Morrus & Rey Misterio Jr.
Shannon Moore & Evan Karagias defeated Jason B. & Scotty O.